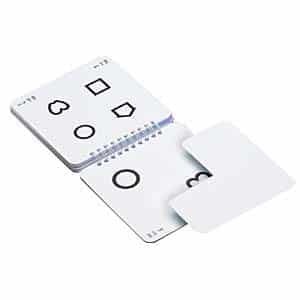 The Single Symbol Book is designed for testing children and adults who have difficulties in perception of symbols in lines. The visual acuity values measured with single symbols are often several lines better than the line acuity values in persons with impaired vision and thus overestimate the quality of visual functioning. Single optotype line sizes from 20/200 to 20/8 (6/60 to 6/2.4) equivalent, 0.10 to 2.50. Includes isolating mask, response key, training cards, and instructions. 13 offset pages for easy flipping. 5″ x 5″ (12.7 cm x 12.7 cm).